The U.S. Women's Hockey team hasn't won gold since the 1998 Winter Olympics in Nagano, Japan. Tonight the team faces off against Canada for another chance at gold. But these U.S. hockey players won perhaps their biggest victory in March 2017, almost a year ago. That came when women on the national team won a fight for better pay and scored a contract that rivals that of the men's national team. The women claimed USA Hockey wasn't paying them a living wage, despite the team medaling in every Winter Olympics since women's hockey debuted in 1998. The men's national team was also afforded more benefits and marketing attention. The women asked for a $68,000 salary and the same treatment that the men receive, including the ability to bring a guest to competitions, fly business class, and have disability insurance. The women also wanted benefits like child care, maternity leave and the ability to compete in more games throughout the year. The feud between the two sides quickly escalated. The women started a boycott of the International Ice Hockey Federation World Championship and USA Hockey responded by threatening to bring on replacement players. The women's team mobilized and was able to convince potential alternates at the college and high school level to refuse to step in to take their place. "A lot of people are going to give the 23 people on the roster a lot of credit, but it was really every single person who turned down an invitation and helped spread it on social media," national team member Monique Lamoureux said at the time. The boycott also drew support over social media from the players' associations for the NFL, NBA, WNBA, MLB, and the NHL. According to NHL agent Allan Walsh, male pro players were "seriously considering" whether to sit out their IIHF games in solidarity with the women. Soccer players on the national women's team, who are waging their own pay fight, also supported their fellow female athletes. And 14 U.S. senators, including Elizabeth Warren, Dianne Feinstein, Robert Menendez, and Cory Booker, called on USA Hockey to treat the women's team fairly. Eventually the women's team was able to come to an agreement with USA Hockey. It arrived three days before the start of the IIHF games, which the U.S. was hosting. The successful boycott marked a pivotal moment for women's sports. While exact financial terms of the final deal weren't disclosed, players on the team told CNNMoney they were happy and neither side had to give up major things. "We're not talking a bunch of specifics in the contract but whatever the men's team gets it'll be on par with what we get from now on," Monique Lamoureux told CNNMoney in March. Her twin sister and teammate Jocelyne Lamoureux echoed that. The women ended up winning the IIHF Championship in a game against Canada, their biggest rival on the ice. Now Canada and the U.S. are facing off on Olympic ice. Canada has won gold at each of the last four Olympics, twice in contests against the U.S.
As the women take the ice on Wednesday, members of Team USA should be confident because of the strength they gained from the protest. 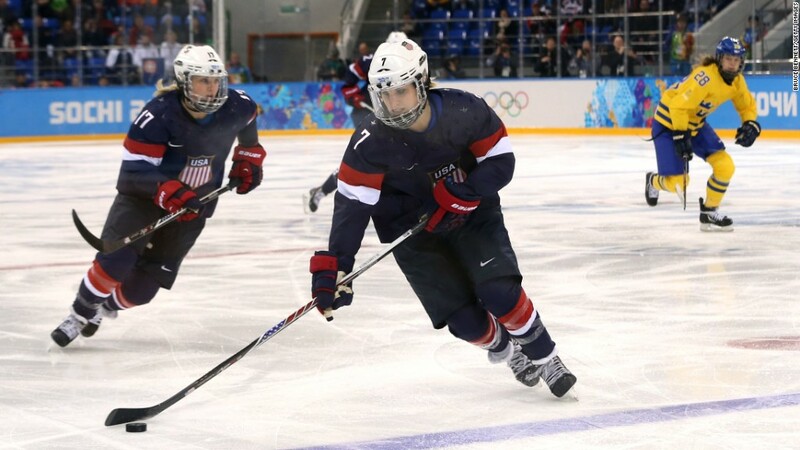 "I feel like it brought a ton of visibility to the sport and woke some people up that women's hockey is the real deal and deserves to be honored," player Meghan Duggan told CNNMoney in March.